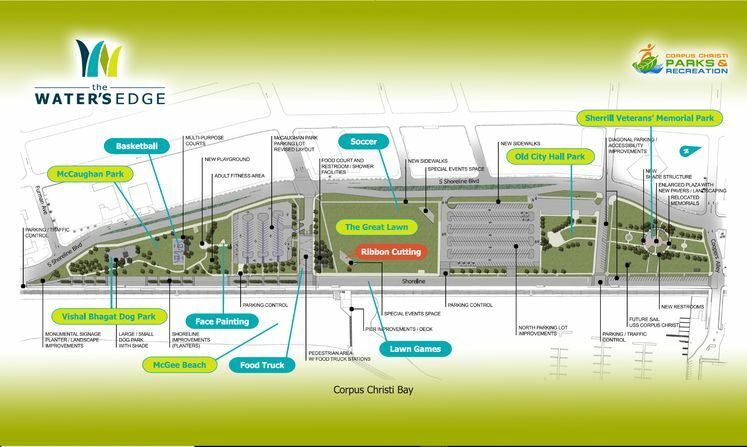 CORPUS CHRISTI, TX – The Corpus Christi Park & Recreation Department will host the ribbon cutting for The Water’s Edge on Wednesday, April 18, 2018 at 6pm. The ceremony will take place at The Great Lawn near McCaughan Park, located at 402 S. Shoreline Boulevard. Elected officials and representatives from City staff who were instrumental in this development project will make a presentation at which time dignitaries and stakeholders will be recognized. Our city is blessed to have the support and partnerships from our residents and many stakeholders to make this scenic and beautiful development a wonderful bayfront destination for recreation and entertainment to be enjoyed by residents, visitors and dogs of all sizes. Funding for this project was supported by residents through their vote for Bond 2008 Proposition 7. The playground and fitness area were made possible by the generous donation of $150,000 from H-E-B Tournament of Champions. The Vishal Bhagat Dog Park was realized with contributions from the Vishal Raju Bhagat Foundation for $75,000, and the Coastal Bend Community Foundation for $51,000. After the ceremonial ribbon cutting, visitors will be invited to join the tour of The Water’s Edge which is nestled along the Corpus Christi bayfront from Furman Avenue to Cooper’s Alley by the marina. McGee Beach and the seawall are part of the attraction which runs along the shoreline. The 22.33-acre development has transformed this area to become the pearl along our crescent-shaped bay. The dog park, multipurpose pavilion and fitness area are new features of the existing McCaughan Park located on the south end. For the foodies, we now have the Food Court that will be home to food trucks serving up some tasty street food and refreshments. The Great Lawn, where the Memorial Coliseum once stood, will be the stage for special events of all kinds from concerts and festivals to runs and more. The gazebo is the focal point of the Old City Hall Park which was the location of the original city hall building that dates back to 1951. On the south end, Sherrill Veterans’ Memorial Park will continue to serve as the site to honor and celebrate our veterans and host military and patriotic events. Shade structures throughout and restrooms in two locations were also added to enhance the visitor experience. 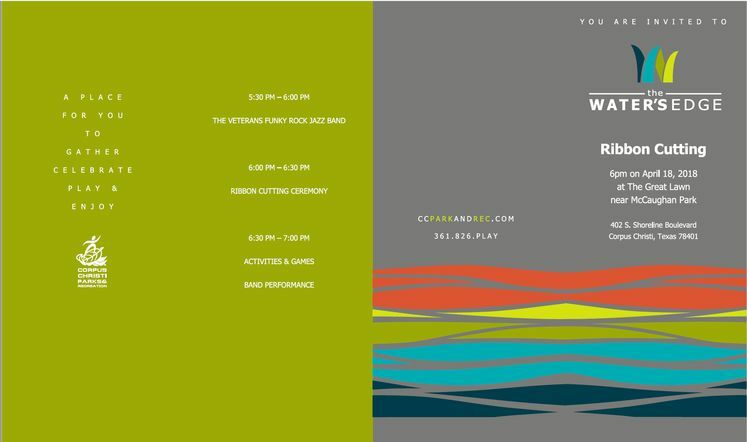 Come fly a kite, explore the playground, ride your bike or participate in other activities taking place that day like soccer, basketball, face painting or lawn games. “I am pleased to report that the master plan development for this project is already proving its economic and quality of life value for our city as it is spurring new business and movement to the area and inspiring the revitalization of surrounding properties that had been vacant for many decades,” said E. Jay Ellington, Director of Corpus Christi Parks & Recreation Department. For more information, contact Mr. Ellington at (361) 826-3464 or by email at JayEll@cctexas.com .